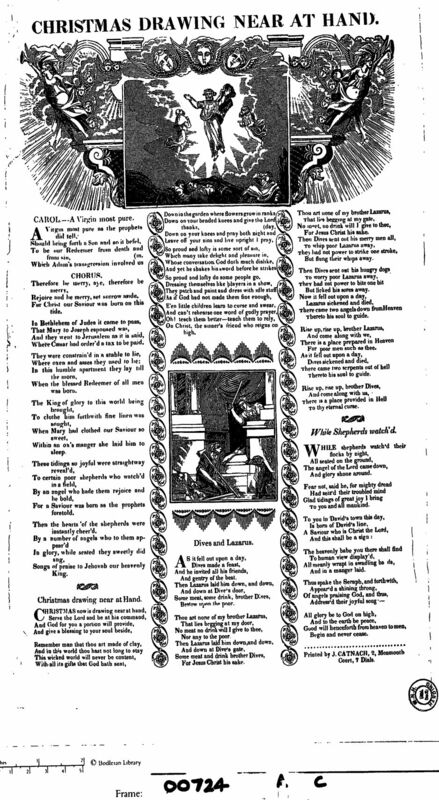 Printed by J. Catnach, 2 Monmouth Court, 7 Dials, Between 1813 and 1838. 1. A Virgin most pure as the prophets did tell. For Christ our Saviour was born on this tide. Where Caesar had order'd a tax to be paid. When the blessed Redeemer of all men was born. Within an ox's manger she laid him to sleep. For a Saviour was born as the prophets foretold. Songs of praise to Jehovah our heavenly King. Carol IV. While Shepherds watch'd their flocks by night. 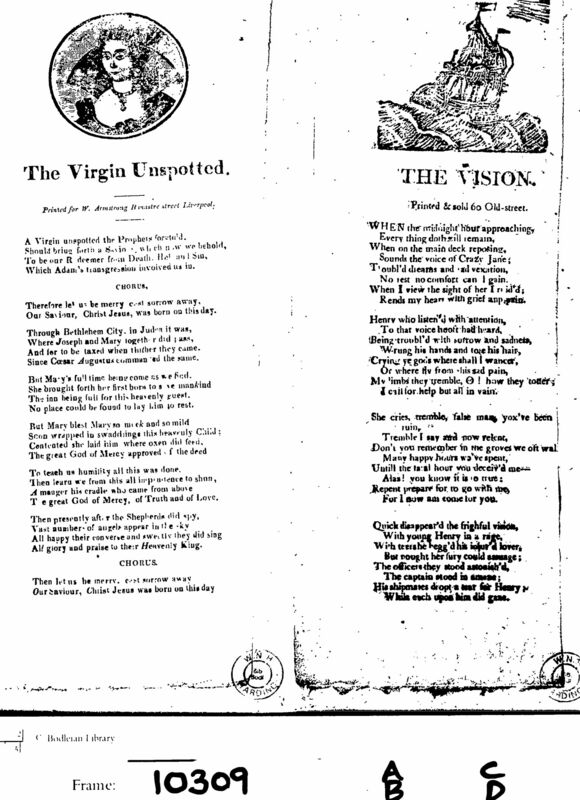 The source for this text is Broadside Harding B 7(4) (Bod19084 at the Bodleian Library). 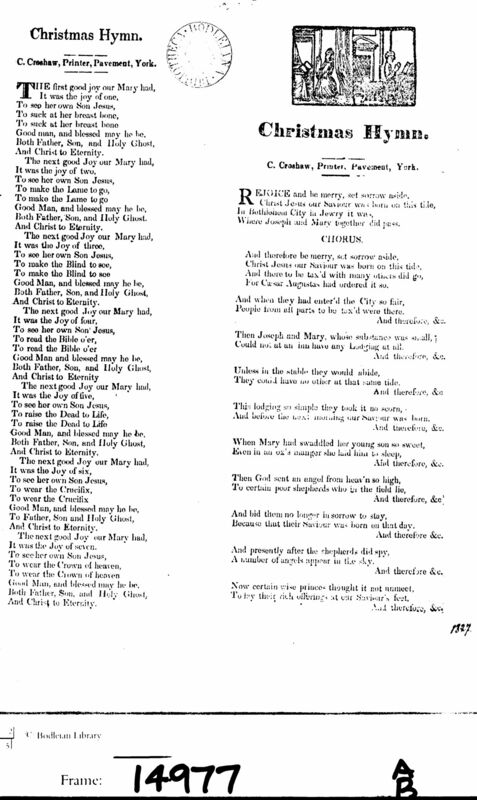 It was printed by J. Catnach, 2 Monmouth Court, 7 Dials, between 1813 and 1838. 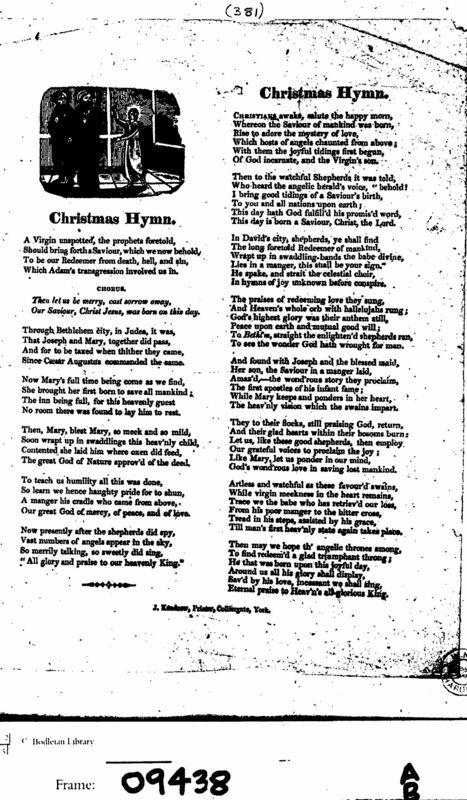 The headline on his broadside is "Christmas Drawing Near At Hand" (this link is to the image at the Bodleian Library). 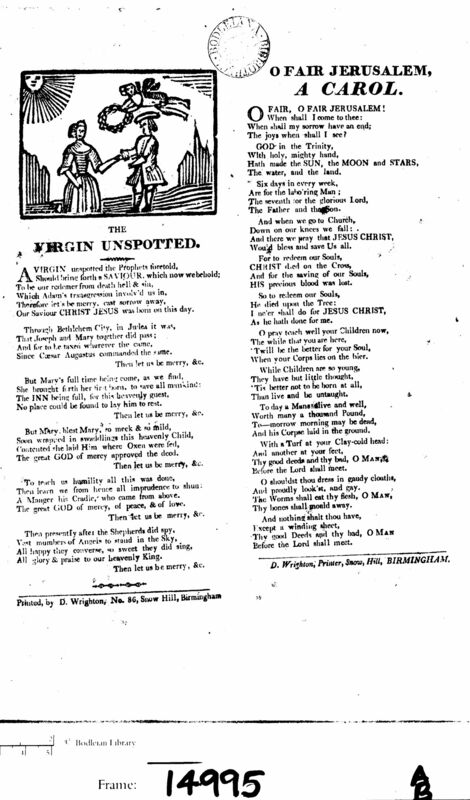 Another Broadside with this version of the carol can also be found at the Bodleian Library, Oxford. 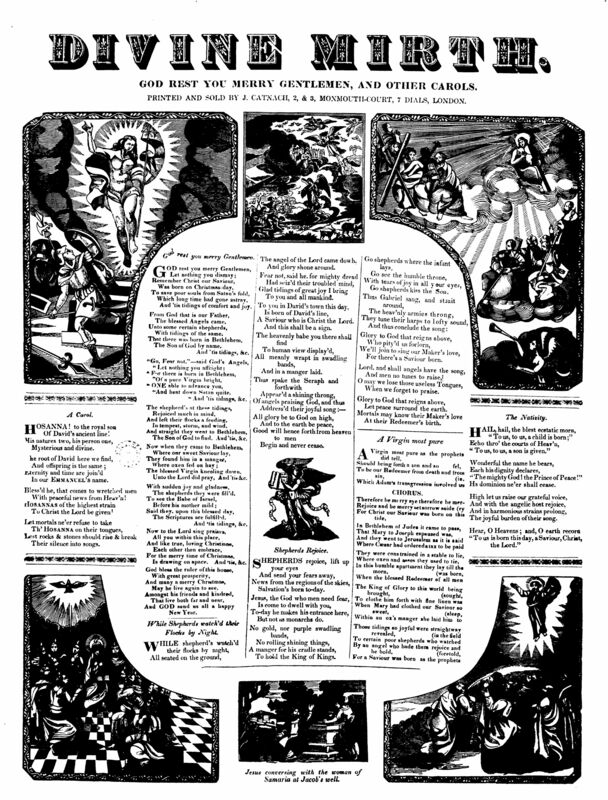 It is Broadside Harding B 45(3) (Bod18895 at the Bodleian Library, Oxford). Printed And Sold By J. Catnach, 2, & 3, Monmouth-Court, 7 Dials, London, between 1813 and 1838. 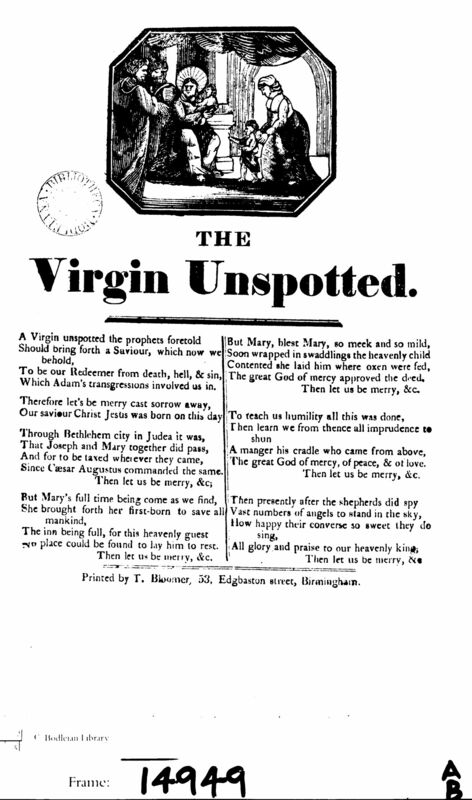 The headline on his broadside is "Divine Mirth" (this link is to the image at the Bodleian Library). 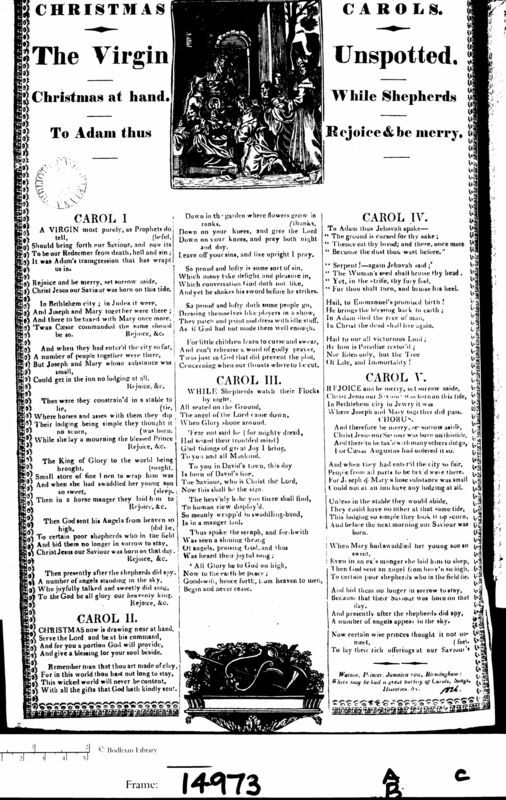 "A Virgin Most Pure" is Carol #5 of 6 carols on this broadside. 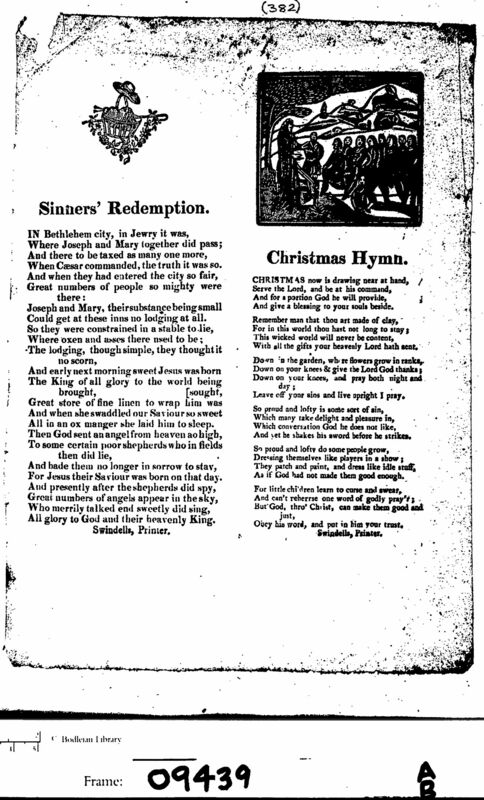 Catnach was a major publisher of Christmas broadsides. Carol I. A Carol (Hosanna! to the royal son) ? Carol VI. The Nativity (Hail, hail, the blest ecstatic morn) ? PS. Did you see the errors in Verse 2? Joseph and Mary were espoused in Nazareth, not Bethlehem. They went to Bethlehem to be taxed, not Jerusalem! See Matthew 1:18-23, Matthew 2:1-23, and Luke 2:1-40. There is also this summary: Biblical Accounts of The Birth of Christ.